Only roughly one in two LAUSD high school seniors is currently on track to graduate, and the district is scrambling to get extra assistance to an estimated 15,000 students in danger of being left behind this June. According to internal district reports obtained by LA School Report, an estimated 54 percent of seniors are on track to meet their “A through G” requirements. The actual graduation rate could be even lower as there are several other requirements to graduate. While the estimate is a stark drop from last year’s all-time high of 74 percent, it has been known for years that the district was facing a steep decline this year, when stricter graduation requirements went into effect. But while the drop was anticipated, the recent internal reports showing a 27 percent plunge from last spring’s rate elicited an alert from the superintendent directing urgent new steps, including weekly updates from staff and letters sent monthly to parents, starting in February, informing them of the necessary courses that need to be completed. The district would not disclose how many seniors had received “off track” letters this month. According to data available in October, the district had 33,420 seniors in the 2015-16 school year, meaning an estimated 15,373 would currently be off track for graduation. The new estimate does not reflect progress by a $15-million credit recovery program begun last fall that puts students in specials classes after school and during breaks to help them pass classes they previously failed. District leaders in November had reported an extremely high participation rate in the program and predicted a high pass rate, which if proves true could land the 2016 graduation rate close to last year’s. Still, despite the optimism over the ongoing credit recovery program, Superintendent Michelle King wrote in a January email to local district superintendents, “This is ‘all hands on deck. '” The email was sent a week after she was installed as superintendent, and King also created a timeline that calls for regular updates to her office as well as benchmarks for the district to meet between now and the end of the semester. 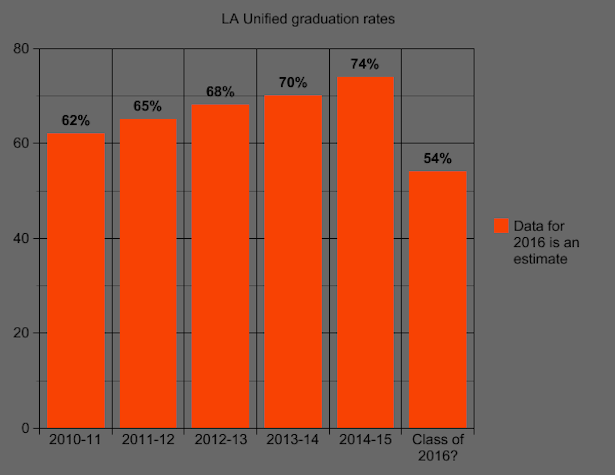 Another district report obtained by LA School Report includes a school-by-school breakdown of estimated graduation rates and shows that some schools are facing a daunting challenge. The Foshay Learning Center (91 percent) and Francisco Bravo Medical Magnet (81 percent) are well ahead of last year’s 74 percent graduation rate for the district, while others like Dorsey High (41 percent) and Verdugo Hills High (43 percent) are far behind. The new A-G graduation standards were drawn up by the board in 2005. The standards, which require students to pass a series of classes making them eligible for admission into California’s public universities, go into effect for the first time this year. The 2005 board thought that 11 years was enough time for the district to improve its curriculum efforts to meet the raised bar, but it was not. In the face of the pending graduation dropoff, the school board amended the requirements in June so that students only need to earn a “D” in the A-G classes and not the “C” that would be required for college eligibility starting in 2017. The move was a significant concession by the board, as the entire purpose of the A-G curriculum was to get more students into college. This year’s class was always to be allowed a “D” to meet A-G requirements. The June resolution reaffirming the board’s commitment to A-G called on the superintendent’s office to develop a long-term plan set to begin in the 2016-2017 school year, leaving the class of 2016 caught somewhat in the middle and without much help but for the credit recovery program. An A-G task force also produced a comprehensive report in the fall that calls on detailed and wide-ranging improvements the district needs to make to improve A-G completion, but much of it is also broader and long-term without much immediate help for the class of 2016. The new 54 percent estimate — which includes all data from the fall semester — is a bump from the last available district estimate, which in October showed 49 percent of seniors were on track with A-G. But with only marginal improvement over the fall semester, it is clear that the credit recovery program is key to making any significant increase before the spring semester concludes. Frances Gipson, the district’s chief academic officer, wrote in an email to LA School Report that the credit recovery program is going well. For credit recovery, each of the six local district superintendents was given the freedom to craft their own plan using a number of options, part of a decentralization effort that was put into place by former Superintendent Ramon Cortines. Each plan rolled out at a slightly different time throughout October and November, depending on the district. Many of the credit recovery options are computer-based, like Edgenuity, which is being used on a wide scale. Students take the classes on Saturdays, during free periods or after school. The computer courses either have a teacher adding some instruction to go along with the computer program, known as blended learning, or it is or an all-online course, known as virtual learning. In the fall, a high level of seniors missing A though G courses were signed up. For example, Gipson — who at the time was the Local District East superintendent before being promoted to her current role — reported that every senior short of an A-G course had been signed up for credit recovery in her district. While Gipson reported that credit recovery is still going well in 2016, she did not offer any estimates as to what level it may impact the graduation rate.